Hot Pink Toccata (2011) for solo organ is a romp for a dramatic and flashy performer. The piece opens with an angular, spiky motive and the first hints of the main theme, both of which recur in various forms throughout. Driving rhythms and moments of mystery ensue, taking the listener on an exciting ride with this incredible and dynamic instrument. This piece was written for and premiered by Katie Burchfield at Trinity University’s Hoffmann/Ballard Kegg organ in May 2010. 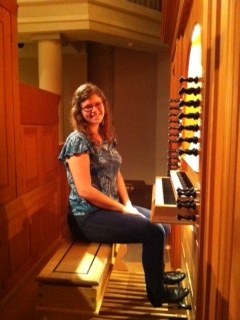 She also gave the Kentucky premiere on University of Louisville’s Steiner organ in October 2011.